Remember this annoying little advertisement on your old DVDs? I went to Google Images to find this and it made me laugh for some reason. Probably due to the fact everyone ignores it. So why do people ignore this? Isn’t it morally wrong to steal, well, anything? To most people, the answer is yes. But yet we have plenty of illegal pirated movie sites that still exists in the inter-webs. Sure they ought to get caught but the fact that people will continue to watch pirated movies will allow the site to exist regardless of the government’s efforts to shut it down. Still, we haven’t answered the question! Why do we still steal movies today? Before I begin, I’ll show you some other illegally copied things that are still being continued today and then I will lead to my point with pirated movies. 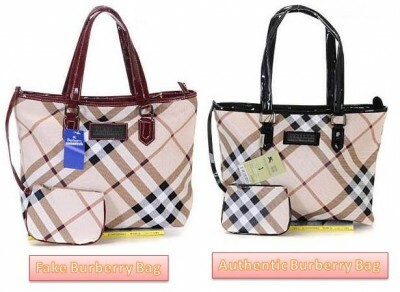 These two Burberry bags are shown side by side to see the differences between the fake and real bags. For one, Burberry does not and will never include a tag with an outrageous color that does not fit its own color scheme. Second, we can assume that the fake bag has a cheap paper tag with plastic wire fasteners. Most designers will never use cheap tags and attach it to their own products. Most of them will use heavy cardstock or cardboard fastened with ribbon or with a more studier fastener. Second, the handles are very different in size and color. The fake bag have handles that are not proportioned equally as they are set too wide on the openings of the bag and too narrow at the top, like a peak. It is also burgundy in color instead of black. On the other bag, it is evenly proportioned to be worn comfortably and we could see the handles are black. The authentic bag is smaller in size and have a smaller leather plaque on the outside than on the fake bag’s. Now enough with the bags, that’s a little too specific. Really, we could see that both are similar and if someone were to go to a marketplace where bags are being sold everywhere, we would assume it’s pretty much the same as the authentic bag. You wouldn’t know how good the authentic bag is and how different it is compared to the phony one. Same with movies. Pirated movies that are copied or recorded from the authentic DVD would usually be about the same and we wouldn’t really know the difference, especially when we go to a reputable site with high quality videos. That’s unless of course, we go on a terrible pirated site with recorded movies from some cheap camcorder. But its a risk for the person producing it, regardless if its movies or bags or whatever. Its the risk people take to make people satisfy they could belong. How cool would it be if I had/done/seen that? Envy drives people insane and makes them do stuff they would never do to satisfy their own cravings. Envy makes people want stuff they know they can’t so going back to pirated movies: hearing how people have seen this movie and how great it is contribute to their desire to watch that movie. They want to belong. Everyone wants to be part of something they’ve wanted to be a part of and missing out on a movie makes them feel like as if they’re not part of that group who has watched it. Yet at their level, they can’t do it so they have to have the second-rate version of it to at least calm their desires down. So instead of paying two grands for a designer luxury bag, you would get another counterfeited bag for $40. These people can provide a way to feed their desire by providing these pirated movies and anything else like it. But doing this is risky and illegal. So we’re compromised: shell out something to end your desire for something or settle for something mediocre and similar to that? Man. If humans weren’t so confusing and complex, we could’ve stopped having counterfeit products and pirated movies. But its the complexity of humans that allows us to complicate, stimulate, engage and explore the world and this life.